I just saw this image on the deviantart. Does anybody know how I could shot a photo like this? From what the artist says in the comments, it seems that it has been created using only one single shot (not so many frames). My guess is that this has been created using Adobe After Effects. Does anybody have any experience creating anything like this? Could you direct me to any step-by-step tutorial? Fill in gap in the where the model used to be, by hand or using content aware fill. Add the model as flat image to the 3D representation of the room at the right depth. Create a path for the camera in 3D. Add lens flare and focus effects. (Optional) render to low resolution .gif to hide the worst of your handiwork! The file is a 1.5 MB GIF file using LZW compression and contains 84 images. To say that it is made from a "single shot" is misleading at best. You can clearly see 3D relative motion of the model against the background. In a "single shot" all the information that is visible in only some of the images would not be available at all. So the creator has either used multiple photos, which violates the "single shot" claim, or they have used a separate background and moved the model relative to the background in each frame. In that case the picture of the model may arguably be a "single shot", but the background is also a "shot" so the claim is really not true in any sensible meaning of the term. Even the claim for the model to be a "single shot" seems false as parts of the model appear to move relative to each other. In the two frames below the models arm is more covered in the left hand (later) frame than in the right hand one. This covering of the arm and hand occurs as the point of view moves from left to right. The quality is so low that it is hard to see exactly what is happening but if you watch the GIF sequence repeatedly you will see that the costume and models arm have a 3D relationship that changes. Again, it would be possible for the "artist" to have added the costume separately and to have moved it between frames, but this again brings into question what a "shot" is. If the costume and the backgrounds are not considered to be 'shots" and have been added separately , then the claim MAY be considered to still possibly be true, but it is getting rather hard to believe. It is possible that this was done by a program which endeavors to create a 3D effect by identifying various parts of the image that can be moved relative to each other. If so, this would explain the claim, but the amount of processing required would be large, and correctly determining what should move relative to something else would be "a challenge". Re a comment on "suggesting foul play"
I did not mean to be be 'harsh" about what has been done or to suggest that it was improper in some way. I wouldn't have used as harsh a term as "foul play". 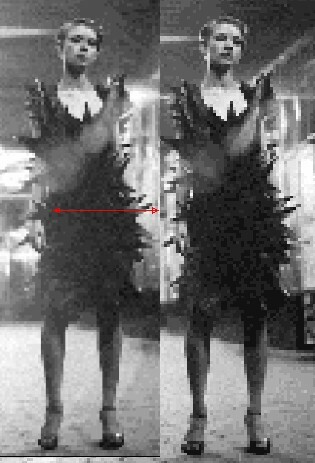 More I'm saying that the very act of combining images, even if they have been derived from an original single one, and of adding material which must necessarily have been missing if a single image was used as source, somewhat stretches the meaning of "single shot". It's entirely possible that the creator added material that was hidden when the shot was made. Watching it replay repeatedly while looking at a selected area show many non-idealities which show how it may have been done. eg a piece of the dress by the right shoulder springs out substanially in the early part of the seuence. Watch the floor outside and behind the left leg and you see a sudden springing up of a shadow effect which does not occur gradually as would be the case with a real 3D pan. Neither of these effects would occur if this was a real series of shots and neither would probably happen if this sequence was completely automatically machine generated. This does not preclude use of manually directed automated tools. This all points to but does not guarantee that the source is a single frame which has had extensive infilling of originally hidden material and adding of effects along the way. An interesting exercise. Not the answer you're looking for? Browse other questions tagged reverse-engineering display 3d or ask your own question. How do I create a “day-night” scene in a photo? What are the techniques for taking portraits using a tilt shift lens? Does anyone have any information on Canon's VL mount regarding pinout and protocol?